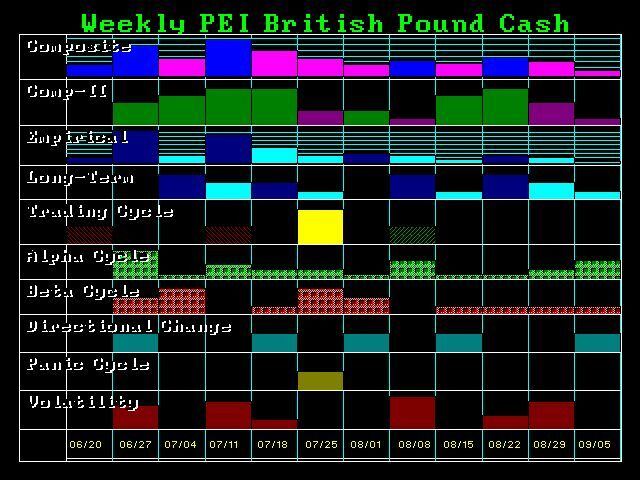 The pound sterling had a smashing day ranging between 15016 and 13226; penetrating the 2009 low of 13508 as well as the 2001 low of 13680. That leaves the prior low that formed in 1985 of 10520 on the cash (103 futures). This is rather important for it implies that we should see that test of the 1985 low as soon as 2017. A year-end closing below 14050 will signal that should follow course. Keep in mind that our model has been projecting a significant dollar rally and the weakening of the EU will make that happen. We have two incredible important numbers coming into focus for the closing of June: 13660 and we also have a Quarterly Bearish at 13680 and 14280. Obviously, if we close June below 13660, we should expect the pound to decline sharply in the months ahead. 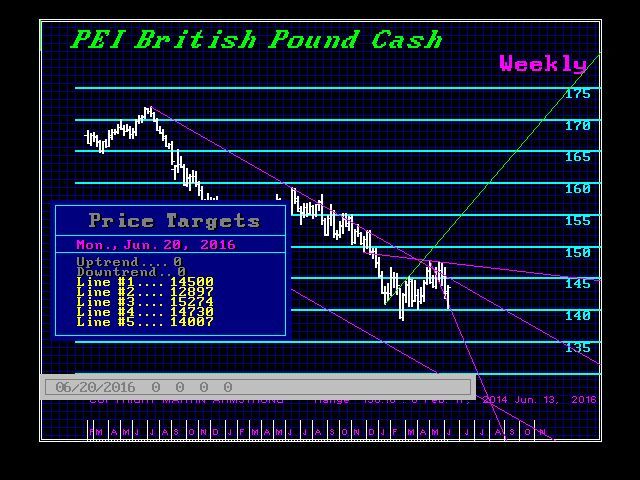 On the Weekly level, a closing beneath 14000 will keep the pound in a bearish position. 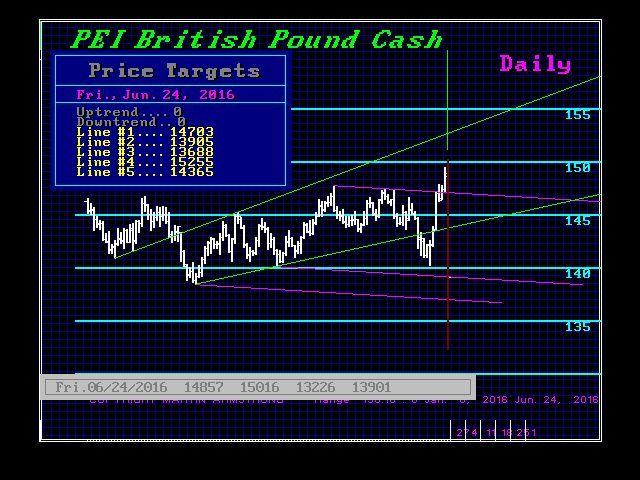 A merely closing beneath 14300 today will also signal that the pound is weak. There will be bearish sentiment, but this will begin to subside as people start to see that the EU cannot be sustained without the UK. 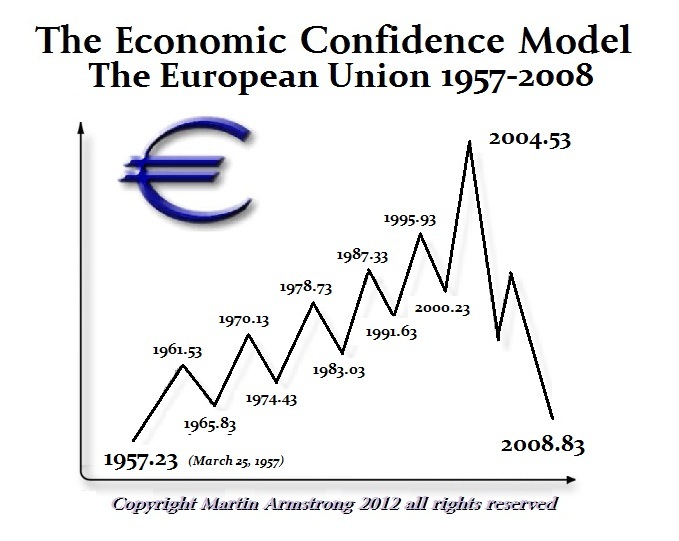 The European Union peaked back in 2004. It is done – just stick a fork in it. The arrogance of Brussels and their anti-democratic approach to force their elitist views upon the people is coming back to haunt them. Unless Brussels reforms, we will see the collapse of the entire EU structure right down to the euro.